Is Kantian ethics really deontological? The answer to this question depends partly on what is meant by deontology. The word was not in Kant’s vocabulary because it was coined around 1813 by Jeremy Bentham (Bentham 1834, 21). The “deon-” part of deontology is the Greek word for “duty,” and for this reason alone it seems an apt category for classifying Kant’s ethics. But there is growing skepticism now that it really does qualify as a deontological theory. 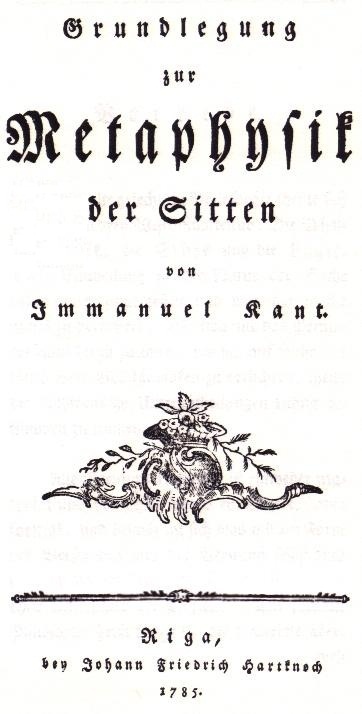 Few seem ready to reject Kant’s insistence, above, that the right must be defined before the good—a hallmark of deontology. But the emphasis he placed on moral ends, especially on humanity’s existence as an end in itself, suggests that ends have a role to play in determining what our duties are, an implication apparently incompatible with deontology. Kant seems to embrace moral realism by claiming that in order to be a valid practical law the categorical imperative must be based on something existing as an end. After he identifies humanity (rational nature) as that end, the formula of humanity is derived; then follows the derivation of a set of duties based on the idea of treating humanity as an end. So it does not seem so clear that in Kant’s ethics duties always precede moral ends—that the right always precedes the good. Among recent interpreters, Herman took the lead in arguing that Kantian ethics has been misclassified as deontological (Herman 1993, 208-41). Guyer has argued similarly (Guyer 1995, 382; 2005, 174-82); so also has Wood (Wood 1999, 114). Respectively, these scholars suggest that the duties of Kant’s ethics are based on the value of agency, or on the value of freedom or autonomy, or on the value of humanity. They suggest that one or another of these conceptions of the good actually precedes the right in Kant’s ethics. Deontology and Consequentialism. A type of ethical theory explicitly putting the good before the right is known as consequentialism. Here, actions are judged to be right, or duties, based on their bringing about the most favorable consequences, as defined by the theory. A well-known type of consequentialism is classical utilitarianism, which was initiated by Bentham and developed in the 19th-century by John Stuart Mill. This theory defined the most favorable consequences—the highest moral end—as overall happiness. Based on this definition of the good, right actions or policies were defined as those bringing about maximum happiness (“the greatest happiness for the greatest number”). Though he was not familiar with classical utilitarianism, Kant understood consequentialism very well. In his day, the dominant approach to ethics among German philosophers was the consequentialism of the Leibniz-Wolff school, which defined the good as “perfection.” The principle of duty following from this definition was expounded by Christian Wolff: Do what makes you and your condition, or that of others, more perfect; omit what makes it less perfect (Wolff 1990, 336). But Kant raised a number of objections to this principle, one of which is that it leads frequently to moral dilemmas, since it places our own perfection in competition with the perfection of others. It is as if, in utilitarian terms, Wolff’s principle commands us to make ourselves as happy as we can be, or make others as happy as they can be, without indicating which should take priority. Utilitarianism avoids this difficulty by defining the good as maximum overall happiness, regardless of whose happiness. So it directs us to act on behalf of our own happiness only when doing so contributes the most to the greatest sum of happiness, considered overall. Otherwise, if what is required in order to make ourselves happier would diminish overall happiness, then we ought to forgo increasing our happiness in favor of increasing others’. Ends of imperfect duties. The distinction Kant drew between perfect and imperfect duties depends on seeing moral ends as duties. It ought to be our end or goal, he explained, to increase our own perfection, which would include developing our natural talents. It ought also to be our end to make others happier. Considering just these duties, Kant’s ethics bears a superficial resemblance to Wolff’s, and to utilitarianism. But in considering such ends to be duties, Kant meant only that we ought not neglect efforts contributing to realizing them. This is quite different from Wolff’s view, or the utilitarian view, that morality requires us to work to bring about such ends. One major point of difference here is that, according to Kant, there would be nothing morally wrong with working to achieve your own happiness, even if something else you could do would increase overall happiness—or even if something else you could do would make you a better gymnast, trumpet player, or architect, or whatever your natural talents make you best suited for. The point is only that you ought not neglect moral ends, not that you ought always to achieve ethical ends to their highest degree of fulfillment. Priority of the right over the good. Regarding the achievement of the ethical ends of imperfect duties there is another, major difference between Kantian ethics and consequentialisms like Wolff’s or classical utilitarianism. It is that not everything we can do to bring about an ethical end is right. In other words, the end does not justify the means, as they say. Or at least the end does not justify just any means someone might take in order to realize it. Utilitarianism is sometimes understood as saying otherwise—or as saying that any action that would result in the overall greatest happiness is right: theft; murder; wide-spread deception, etc. While actions like these may cause some unhappiness, it is possible that they nevertheless bring about the greatest overall happiness. In contrast, Kant’s distinction between perfect and imperfect duties grants perfect duties priority. Since actions like lying and other rights-violations are contrary to perfect duties, they are wrong in Kantian ethics even when they may be useful for realizing ends of imperfect duty. A principle for prioritizing a set of ethical ends cannot be derived from any of the ends. A principle of equality for a set of ethical ends cannot be derived from any of the ends. The general point is: any principle for ordering ethical ends, whether ranking them or recognizing their equality, must be independent of and logically prior to ends. It must be a fundamental principle of duty, since the order of ends it specifies will determine duties in regard to those ends. For this reason, even though Kantian ethics emphasizes ethical ends, it must be recognized as, fundamentally, a deontological theory. The formula of humanity, which tells us never to treat our own or another’s humanity as an end, is a principle of duty expressing an order of ends. It tells us that every member of humanity ought to be treated as equal in value. A principle like this is deontological; it cannot be derived from the value of any end. Bentham, Jeremy (1834), Deontology, or the Science of Morality ed. John Bowring (London: Longman, et. al.). Guyer, Paul (1995), “The Possibility of the Categorical Imperative,” The Philosophical Review 104: 353-85. _____ (2005), Kant’s System of Nature and Freedom, Selected Essays (Oxford University Press). Kant, Immanuel (1997a), Groundwork of the Metaphysics of Morals, trans. Mary Gregor (Cambridge: Cambridge University Press). _____ (1997b), Critique of Practical Reason, trans. Mary Gregor (Cambridge: Cambridge University Press). Wolff, Christian (1990), Reasonable Thoughts about the Actions of Men, for the Promotion of their Happiness (selections), ed. and trans. Jerome B. Schneewind, in Moral Philosophy from Montaigne to Kant, vol. 1 (Cambridge: Cambridge University Press). Wood, Allen W. (1999), Kant’s Ethical Thought (Cambridge: Cambridge University Press).